Hello Friends! It’s Wednesday, March 10, 2010, Alan here: I’m sitting in the puffy chair now. Some of you know what that means. Chemo Clinics have the poofy-est recliners known to man for chemo infusion. My bloodwork was good this morning and now I’m hooked up and getting my anti-nausea drugs before they hit me with the hard stuff. I’ve got some stuff on my mind and I’m gonna see how fast I can impart it to this page so I can post this now. If I don’t hurry up, I’ll have to wait a while to post as the chemo drugs mess up my vision. I wanted to talk about self-perception a little bit today. Have you ever had doubt? A little self-doubt or insecurity? Ever thought, “I can’t do this?” or “I’m insufficient for this task?” Unless you are within the extreme minority you’ve thought this and either demurred from the task at hand or faced it with a half-defeated attitude. Most of the time we learn that our estimation of self was overly pessimistic and our estimation of the task or challenge that we faced was overly generous. In life we have different mirrors with which we can choose to examine ourselves. We don’t have to choose one or the other. We can take a blend. I think that one mirror is our self-estimation (very much like self-esteem) and the other is the communicated estimation of ourselves from others. Internal and External. Somebody telling me “Yeah Baby! You can do it!! !” can make me lift more weight than I thought I could. So many of you have reached out to me and given me a “spot” in this battle. I thank God for you. My Vectibix just showed up, so I need to hurry or you’ll start to see a lot of errors in my typing. Getting to the point, I want to mention, in summary, how important the external spot is. Folks have told me I’m strong when I feel that I’m really weak. People have told me I’m brave when I’m so very frightened. People have told me that I can do this when I’ve had terrible doubts running in my head. It is so important to have that external mirror help describe our capability to meet a task. An encouraging friend is, indeed, a treasure. So many of you have reached out to me and all of it has been appreciated. I’ve been struggling over the last couple of weeks and words of encouragement have helped me get a handle on my bootstraps. I can still see, but I’m gonna draw to a close here. The next couple days will be blotto for me so I’ll talk to you again soon…but not too soon. Thanks for your encouragement. I’m lifted by it and all your prayers. Love! PS. Something funny: Here in the chemo clinic I just received a huge compliment. I was just asked, “is that a toupee?” Yeah Baby, YOU can do it!!!!! Alan, I finally watched the show “I Was Dead.” It was awesome. I also went on Facebook and asked for Jerry to be my friend, but he might be pretty busy right now. He was definitely my favorite. I felt a little sorry for Dr. Nelson. He doesn’t have a clue as to what’s really happening. I just noticed on your Dovebridge the Salvation: Costly and Free link and also added that to my Facebook page. Thank you for all you do. God is truly using you during your time of trial. Hugs to everyone! Hope that you’re having a good week. We’re still praying for you & yours. Take care. Hadn’t seen an update lately and just wanted you to know that Joy and I are still praying for you and the family daily and hope all is going well. Hang in there and stay strong! just checking in with you. we haven’t seen an update in a while. we’re praying for you guys. I’m a believer. I’m a believer. I don’t know about you, but I’m a believer. I awake in the morning just praising the lord, that I’m a Christian. I have no doubt, where I’ll be after death. It’s such a bad feeling knowing friends, who will pass one day. Without their heart being filled with your word, and with your praise. He’s so amazing the things he can do. You’ll be surprised how many times he pursues. If this happens, just take the clue. Our God gives. Our God loves. Our God saves. He’s waiting for you, up in his kingdom. Just love and adore and cherish his wisdom. All you have to do is accept and love him. One day it will be great. When Jesus returns and slaughters Satan. The whole world will rejoice and praise. You can do anything through Christ alone. Just like we said, bow to his throne. He will accept and invite you in. If only you will weep from all of your sin. Our God is almighty, powerful and majestic. God is life and there is no reason, to live our live except to glorify Him. We can now rejoice, because we’re believers. You have been my inspiration while training for a 5K. When I don’t think that I can run another minute I think of you and what you face every minute of everyday and I cannot let myself stop. I never thought that I could run for 30 mins, ever in my life, and after 8 weeks here I am running faster and farther than I ever imagined! You are right….we can overcome…and you are! Once again you nailed it. It amazes me how eloquently you transfer your thoughts and experiences of this journey into so few words on your blog. It is a journey and we are all here, standing beside you and even behind you to give you that extra push. I don’t think you can ,I KNOW YOU CAN ,WHEN WE ARE WEAK GOD WILL CARRY YOU ,FAITH AND I KNOW YOU HAVE IT. Prayers are with you and the family ,and the GRACE OF GOD BE WITH YOU. Love you ,your bro. from Ga.
Alan – I read every post and comment rarely, I guess because it seems best reserved for your closest friends and family. I stumbled upon a concept a few days ago that I want to share with you. By way of background, I am eyeball deep in an administrative restructuring project at Duke. I was challenging (hard to believe, I know) one of my colleagues on whether the recommendations proposed are bold enough to be good enough. I received the reply: “this puts us right in the sweet spot”. I countered with “that’s not good enough, we deserve to be the best”. That’s my new mantra. I hope I can live it the way I’ve observed you live it for the past 6 months. You are consistently the best at demonstrating your ability to rise to each occasion, fighting with all your might, and teaching us all to do the same along the way. Everyone is spotting you, so keep pushing the limit! Toupee? Hillarious. I hope you’ve overestimated the difficulty of your recovery from this round my friend, PUSH. And a note to all, I’ve discovered a sure-fire pick-me-up for any blues, a new reality series on PIX (channel 11 in NYC) called High Society, staring Tinsley Mortimer. A guilty pleasure it is to lauch AT other people, but these characters deserve it!! Continue to enjoy every post. You and your family are remembered daily in our prayers. When you have those doubts of if you CAN DO IT just look at those beautiful children and Misty and remember why it is so important to DO IT. Also, think of all the people that you are a witness to. Alan, you will never know the number of people that you have reached with your testimony and your writings. This is your mission field. Yes Alan, YOU can do this!!! And when you have your moments of doubt, just rely on your true “spotter” Your Heavenly Father. Also remember your earthbound “spotters” that are more than willing to lend the encouragement, hand, or boot that you need to remember that YOU can do this! Rest well and recover quickly from round 15. You do not know me but i know you through your sweet wife. Misty is consigning with me in my upcoming sale. I wanted you to know that I read all your post. Sometimes I cry and sometimes I laugh! What a inspiration and your testimonty your life is too MANY (even when we don’t comment). Misty might have told you but we are dealing with some serious stuff right now with my husband. We have some diffcult decisions to make. I have seen how God though has orchestrated each step of this journey with my husband illness. At the time I did not see how he had his hand in it all. BUT I do now especially after I got over the shock! I see this is yours and Misty life too! Just wanted you to know I am reading and I am praying! Your sister in Christ! You are amazing! You reminded me of the verse,”I can do ALL things through Him who gives me strength”. Hope that the side effects aren’t as bad this week. Love you lots! Create in me a pure heart, O God, and renew a steadfast spirit within me. Alan, you have a steadfast spirit and encourage all of us. And thus, the beautiful evolution that this journey is taking you on…a year ago “is that a toupee?” would have hurt your feelings; now it is quite the compliment. Alan!!! You just made me laugh out loud! 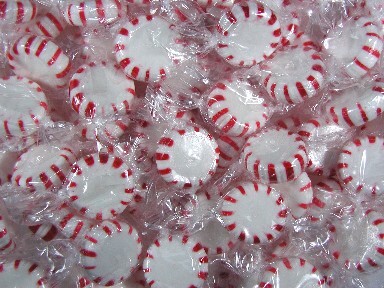 I will never look at a peppermint the same! I’m praying for you daily, please know that! You CAN DO IT! I’m not eloqent in my speech….just fervent in my prayers!! Alan, we’ve been keeping up with you through your caringbridge site as well as hearing from friends. You are in our prayers. Sometimes we feel like we are at the end of our ropes, but with God’s help “we can do this”. Hang in there!